Which brings me to this post. Many of you probably have heard about Israeli plans to renovate a bridge that leads up to the Temple Mount, and the news that Israel officially closed it on Sunday. You may have also heard of Arab and Palestinian objections to this act, claiming that Israel is aiming to undermine the physical structure of the al-Aqsa Mosque and the entire Temple Mount. This hubbub, like so much else in the Arab-Israeli conflict, can only be understood with two things kept in mind: the physical reality of the place that you can see in person, and the context of history. I say this because most westerners have very short memories. 10 to 15 years is practically ancient history in the West. But really, you can’t understand the politics of this land without going back at least 150 years. So what I would like to do is try to present the facts about the Mughrabi Bridge, and put them and this entire issue into a historical context. If at any point I do dip into opinion, I will do my best to indicate that clearly. With all this, I hope to avoid politics as much as possible (thus the post’s title), and simply present as objective a version of the truth as I possibly can. Then it will be up to you, my hopefully intellectually-honest readers, to judge the issue for yourselves. I suggest you do further research to see if you can find conflicting facts. But I also request that you do your best to ensure that they are actual facts you are finding. If you have never been to the Western Wall plaza, and/or never seen the Mughrabi Bridge, this might seem like a plausible complaint. After all, if a ramp leading to the Temple Mount is demolished, couldn’t that do damage to the Temple Mount itself? But as anyone who has been there knows, this is not really the case. For starters, the bridge is not a part of the Temple Mount / Al-Aqsa Mosque Compound. It does not touch the foundations of the walls surrounding the complex. It barely runs up to the walls, and is not structurally connected to those walls at all. This marked up aerial photo illustrates clearly that the ramp is not a part of the Temple Mount or Al-Aqsa Mosque in any way. But couldn’t rubble fly everywhere when Israel demolishes the bridge, thus damaging the walls inadvertently? Well it could if the bridge were built of heavy stone or concrete, and if that demolition took place in a haphazard fashion. In reality, however, the bridge as it currently stands is barely more than a thin metal scaffold holding up a temporary wooden structure. And that structure would not be removed haphazardly since it rises above an area where thousands of women pray every day. 16. During its visit on 28 February 2007, the mission observed that archaeological excavation works involving about 40 workers were conducted on all parts of the pathway, under the supervision of two archaeologists from the IAA. 17. 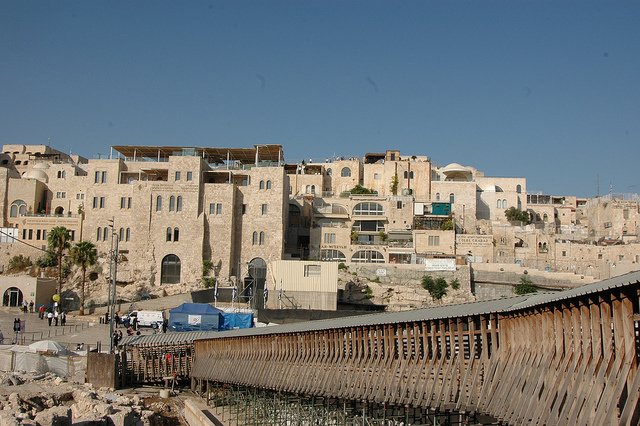 The works observed concern areas external to the Western Wall and are limited to the surface of the pathway and its northern side, where the retaining wall of the access collapsed in 2004. The mission noted that no work is being conducted inside the Haram es-Sharif, nor may the nature of the works underway be reported, at this stage, as constituting a threat to the stability of the Western Wall and the Al-Aqsa Mosque. 18. 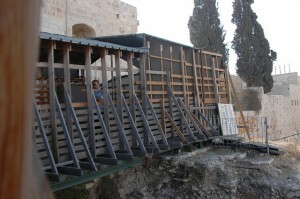 The work area ends at approximately 10 metres distance from the Western Wall. It is conducted with light equipment, picks and shovels, and it is supervised and documented according to professional standards. Further complaints quoted in the above article take things a bit further. A spokesman for Hamas is quoted as saying this “shows the Zionist scheme of aggression against the Al-Aqsa mosque” and that it “amounts to a declaration of religious war on the Muslim holy places in Jerusalem.” That seems (in my opinion) quite an overstatement to describe the orderly removal of a flimsy scaffold that was always intended to be temporary, but maybe we can write that off as predictable hyperbole from a recognized terrorist organization. Now I hear some of you asking, why would the Arabs lie about this? Isn’t this just some giant conspiracy theory of the Jews with their persecution complex? Well, in answer to that we must move to the second part of our formula and place these complaints into their historical context. Surprising as it may seem, Jews and Arabs did not always hate each other. In fact, historically, they often lived peacefully side by side, engaging in intellectual and commercial exchanges. This was never a problem to Islam while they were the controlling power. Thus, the local Arabs in Palestine never had significant problems with the Jews here until the (Muslim) Ottoman control began to weaken towards the end of their rule. (They were in control here from 1517 to 1917.) But through the 19th Century, things began to change here, and while the Ottomans became weaker, Jews (and Christians) began to gain many more rights. Arab attitudes towards the Jews slowly began to change, and this only became exacerbated following World War I when, for the first time in 700 years, Palestine was not controlled by an Islamic power. Led by charismatic local nationalist figures, the narrative of the Palestinian Arabs began to change in a propagandist fashion to de-Judaize the history of this land. Despite all scholarly recognition of the historical connections of the Jews to Israel and Jerusalem in particular, the Palestinian and wider Arab community began to repeat the same Jew-free lies over and over until people started to think they were truths. For example, you may have heard that the Western Wall itself is holy to Muslims since it is the spot where Muhammed tethered el-Buraq, his magical winged beast, during the “Night Journey” that is commemorated by the Dome of the Rock. But as has been widely reported, Dr. Shmuel Berkovits did comprehensive research on this and found some very interesting facts. Until the mid-19th Century there were a few different places on the Temple Mount associated with the tethering of el-Buraq. But they were all on the Eastern or Southern walls, never the Western! So why the invention of this new “holy place?” Because the Western Wall was the holy spot to which Jews had been coming to pray for thousands of years. And as tensions flared, many different attempts were made to remove Jewish claims to that one spot. It is these same attempts that led to Arab riots against Jews in 1929. Think this may be an isolated situation, and not part of an extended pattern? You want another example? Okay. 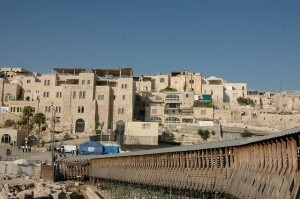 Less than a year ago, in March 2010, a large synagogue known as the Hurva was re-dedicated inside the Jewish Quarter of the Old City. (I say rededicated, instead of just dedicated, because it had been blown up by Jordanians in 1948, but that is a post for a different time.) At the time, the Palestinian Arabs claimed that it was an attempt by the Jews to replace the Al-Aqsa Mosque with the Third Temple. Again, a little geography lesson might be helpful here. The Hurva is located (as the crow flies) about a half a kilometer from the Al-Aqsa Mosque. Walking from one to the other would require a more circuitous route, so it would take at least 10 minutes to get there. How is this an even plausible complaint? They tried to make it seem closer, by describing the distance between the two structures as “tens of meters.” Well yes, if you mean 50+ tens of meters. By that logic, it is also tens of meters from Mecca itself. Thankfully that complaint didn’t get a lot of notice, I hope because people recognized it as ludicrous. But the Palestinian claims related to the Mughrabi Bridge are less likely to disappear. Many complaints have focused on the specific claim that Israel is trying to undermine the Al-Aqsa Mosque, despite the fact that Israel willingly handed control of the Temple Mount complex to the Waqf just hours after Israeli soldiers conquered it in the Six Day War. And while Israel protects access to all holy sites for all religions, that same Waqf has limited access to the site. What do I mean? In the past, Jews, Christians and anyone else could visit the Temple Mount and enter the golden Dome of the Rock shrine and the Al-Aqsa Mosque itself. As this post notes, the Waqf changed the rules in September 2000, preventing all non-Muslims from entering the Temple Mount complex. As of August 2003, Israel made them reopen the Temple Mount, but to this day, all non-Muslims may only enter the Temple Mount via the Mughrabi Gate, and only during certain hours of the day. Once up there, they may only walk around on the platform and cannot enter any of the buildings. Just the other day I was speaking about those complaints that Israel is trying to destroy the mosque, and I predicted something that I’ll state again here and now. Israel is a highly active tectonic area, and is prone to major earthquakes every 100 years or so. Many here have been fearing that we are somewhat overdue for another big one. If it comes, and God forbid the Al-Aqsa Mosque is damaged or destroyed, I guarantee that the Palestinians will blame the collapse on Israel. But let me fill you in on a little secret. The Al-Aqsa Mosque that stands at the southern end of the Temple Mount today is not the original Al-Aqsa Mosque. In fact, it has been renovated and rebuilt many times. This is because the southern part of the Temple Mount is one of the two areas in which Herod extended the mountaintop itself. To do this, he built the top platform on a series of vaulted arches. What this means is that that area is much less stable, and more prone to earthquake damage. Think I’m just making this up? Nope. That’s why the Al-Aqsa Mosque was damaged or destroyed in earthquakes in 713-714 and also in 749. Oh, and also in 774. And in 1033 too. I hope it doesn’t happen, but it will not be surprising if it collapses in the next big earthquake here. And think my prediction is overly cynical? Well guess what I came across when I was preparing for this post. This claim that Israel is planning to destroy Al-Aqsa by creating an artificial earthquake! Well, if we can train sharks to attack tourists in Egypt, why not this as well? No, but seriously, with claims like artificial earthquakes, would it be the least bit surprising if they blame Israel should Al-Aqsa fall in a quake? So where does this all leave us? In a situation where propaganda is being accepted as fact. Why? Because when ignorance of the facts is combined with preconceived emotional sentiments in favor of one side, listeners are perfectly happy to believe in the veracity of lies. Thus, the intellectually honest of the world need to look past the emotional and overblown language and try to see the facts as they stand. And then to hopefully convince others that the claims they hear are not truthful. The only path to a real solution is through truth, honesty and openness. Intentional obfuscation will only lead to the perpetuation of a bad situation for both sides. When tourists asks me about the politics in Israel, I answer with a true answer, if they believe in god I manage to get them to the right-wing ideas, if they do not, I ask them about U.S.A, not that difficult, let me say this, even if he support palestine, the tourist will be a great supporter of Israel, after a chat with me.